The Fury Fingers team has just published their original web-series “GOONS INC.” An action driven comedy-adventure about what life (and death) is like as a video-game goon. 'Goons INC' is the industry best in henchmen, thugs and hired muscle. A typical working day for a goon-employee might include being shot as a soldier, lasso’d as a cowboy, stabbed as a knight, beat up as a gangster and blown up as a space marine... Whatever canon fodder you need - Goons INC is your one-stop shop for all your peon-casting and killing needs. But when a Goons INC employee is disintegrated on the job and DOESN'T re-spawn, shy Joe forms an unlikely group of rebels to solve the mystery of what happened to his best friend. Action and comedy ensues as the underdogs try to figure out what sinister plans may be forming behind the scenes at Goons INC. And as bad guys they learn the true nature of what it means to be called a hero. (Oh, and there’s also a subtle narrative woven into the series regarding women's representation in gaming)! Combining elements of sci-fi, fantasy, drama and mystery, Goons INC features four 10 minute episodes full of VFX, sword-fights, detailed costumes, fight choreography, stunts and impressive locations. Many sets required advanced make-up teams, massive crews and plenty of extras. ‘GOONS INC' the web series is the collaborative efforts of South Australian filmmakers Andrew Shanks, Nicholas Cleary and Daniel Vink. Creators of the popular YouTube channel: FURY FINGERS. Frustrated with traditional funding pathways, these filmmaking friends decided to use their free time and combined media powers to make fun, offbeat and action packed homages to their favourite video games. Made in Adelaide, South Australia ‘Goons INC’ was put together for the small and conservative budget of $15,000. Most of the which went to gear and catering for the crew. 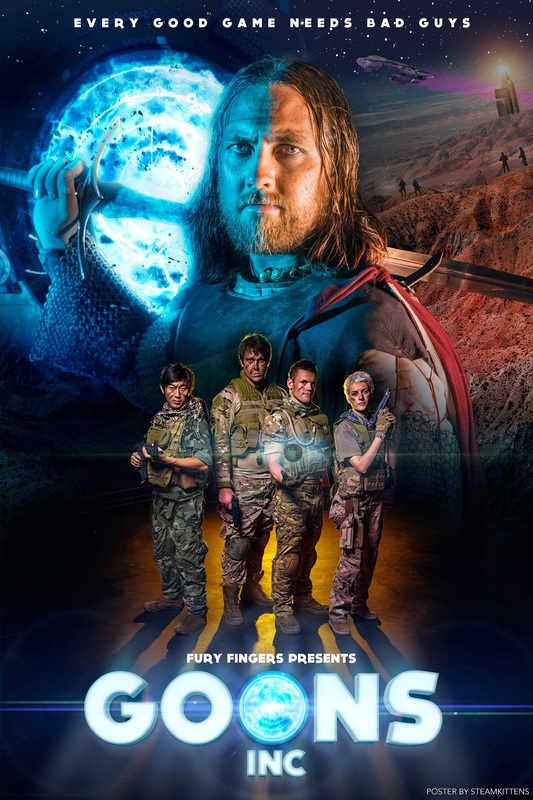 Over the years ‘Fury Fingers’ has grown to become a strong community of unique artists consisting of eager film-makers, actors, cosplayers, prop builders and makeup specialists. Goons INC is proof of what can be achieved through creative passion, friendship and ingenuity. Goons INC won it’s hometown award Award for Best Web Series at the South Australian Screen Awards, it was accepted into Melbourne Web fest where it gained entry into Berlin Webfest and Seoul Webfest. It featured in Berlin’s ‘top picks’ section, where it was celebrated for its strong storyline and clever blend of Genres. And at the Asia Web Awards Goons INC was selected for best special effects.